We've already had celebrations for PUBG and Warframe today, but now it's Elder Scrolls Online's turn to get the party started as the franchise celebrates its 25th anniversary. In honour of the milestone, ZeniMax Online Studios has announced an Elder Scrolls Online free play event running across all platforms from Thursday, March 28 until Wednesday, April 3. "It has been 25 years since The Elder Scrolls: Arena’s release in 1994, and we are thrilled to be part of this incredible milestone with The Elder Scrolls Online," states a timely update on the ESO website. "To celebrate this amazing anniversary, you can begin your journey to the Khajiiti homeland with the Elsweyr Prologue, enjoy sales on the ESO base game and Summerset Chapter, and try the game out free, no strings attached, during our Free Play Event." 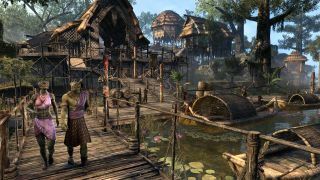 As the Free Play Event includes access to the base game, this means even free play players can access the new Elsweyr Prologue Quest, as well as visit the Morrowind zone to explore Tamriel and the island home of the Dark Elves. If you've yet to give ESO a try, head on over to the game's Free Play page now to select your platform. If you're suitably convinced after you've tried it out, both The Elder Scrolls Online base game and The Elder Scrolls Online: Summerset will be discounted until April 9 and April 2 respectively. For players already committed to ESO, the Elsweyr Prologue—in which "you can discover the true purpose of the Wrathstone" and "unleash Dragons upon the unsuspecting Khajiit of Elsweyr"—goes live later today. As the Prologue is part of The Elder Scrolls Online base game, you won’t need the Wrathstone DLC or a The Elder Scrolls Online: Elsweyr pre-purchase to access this new adventure. For more, head on over to the ESO website.